13 June 2006: With just under half of its population living in cities, the world is already urbanised. When measured in knowledge, attitude, aspiration, commercial sense, technology, travel and access to information, most societies are now being woven into a global network of cities. Globalisation seriously took off during the industrial revolution of the late 18th century. Since then, the steam engine, the telephone, the elevator, and now, the Internet and cheap air transport, have conveyed people, goods and ideas both horizontally and vertically at an unprecedented volume and velocity. The focal point of these activities has invariably been the city, a place of deals and decisions, take-offs and landings - a place less concerned with the rhythms of nature, where everything can be bought or sold, especially one's ideas and labour. Three billion people - nearly every second person on earth - already live in cities and by 2030 over 60 per cent of the world's population (4.9 billion out of 8.1 billion people) will live in cities. Developed country cities are rapidly disappearing from the list of the world's largest cities. Between 1980 and 2000, Lagos, Dhaka, Cairo, Tianjin, Hyderabad and Lahore, among others, joined the list of 30 largest cities in the world. 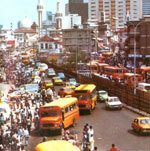 Within the next decade Lagos is projected to become the third largest city in the world, after Tokyo and Mumbai. Milan, Essen and London will disappear from the 30 largest cities list. New York, Osaka and Paris will have slipped farther down the list, (and new entries such as Johannesburg-Pretoria may be on it). The UN Habitat State of the World's Cities Report takes the reader through the continents to better understand how shelter, society, environment, economy, and, above all, systems of governance can contribute to urban vibrancy and viability in a megacity and highlights the rapid changes taking place in Africa and other economies in transition. The key finding is that a megacity's success rests on local shoulders and that it is vital that the structures of governance be more responsive to individuals, households and communities so that both national and local authorities can better serve society, each through separate but complementary instruments. • Economy: Sustainable urban development in megacities will depend on the creation and maintenance of efficient land and property markets; the development of more and better housing finance options; a greater emphasis on municipal finance and institution building; strengthening of urban utility systems; a growing interest in the preservation of cultural assets and heritage, and the responsiveness to emergencies such as earthquakes and flooding. • Housing: More than one billion of the world's urban residents live in inadequate housing, mostly in the sprawling slums and squatter settlements in developing countries. Extending urban citizenship to the poor is one of the most far-reaching decisions that can be taken in promoting a sustainable shelter strategy. • Social society: Despite the potential of cities to improve living standards, the benefits of urbanisation are not shared equally. 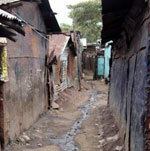 Cities are divided into the haves and the have-nots; the established and the marginalised. For example, over 50 per cent of the population of Mumbai and New Delhi live in slums, while in Lagos and Nairobi over 60 per cent of households remain unconnected to water. Exclusion, as a result of physical, social or economic barriers, prevents many groups from participating fully in urban life and services. Failure of local authorities to integrate such groups in their decision-making is often a function of inertia, along with bureaucratic and unresponsive forms of governance. • Employment: Informal sector employment makes up 37 per cent of the total employment in developing countries as a whole, and is as high as 45 per cent in Africa. By relaxing rules and regulations, the informal sector can be expected to contribute further to job creation and, perhaps, eventually be integrated in the formal economy. • Governance: People must assume their responsibilities as citizens by participating in decision-making and implementation. Issues and priorities that need to be addressed include: redefining the roles and responsibilities of central and local governments; promoting city-wide development strategies; regulating equitable financial transfer between all levels of government; encouraging transparency through free flows of information; effective civic engagement and participation; and strengthening leadership while promoting ethical conduct in the governance of cities. • Environment: Environmental degradation and pollution continue to constrain development and growth of cities. It is crucial to improve the relationship between the environment and development.